Home » Education Reform » The unions make public schools bad, right? Actually, that’s not what the data shows. The unions make public schools bad, right? Actually, that’s not what the data shows. Michael Marder is physics prof at the University of Texas at Austin, and Co-Director of UTeach (“We prepare teachers. They change the world.”). He’s a scientist who has found communicative ways to visualize his research data. Sometimes he applies that skill to education issues to see what’s really going on. Here is his look at the role unions play in student achievement (taken from page 8, here). and lifetime employment of K-12 teachers is off-the-charts crazy. But then he displays simple data that tells a different story. Each disk is a state. The red disks are “right to work” states, which he characterizes as “weaker union” states. The blue disks are “stronger union” states. States with and without strong unions are intermingled. Well-off students in wealthy states with strong unions have the highest outcomes. 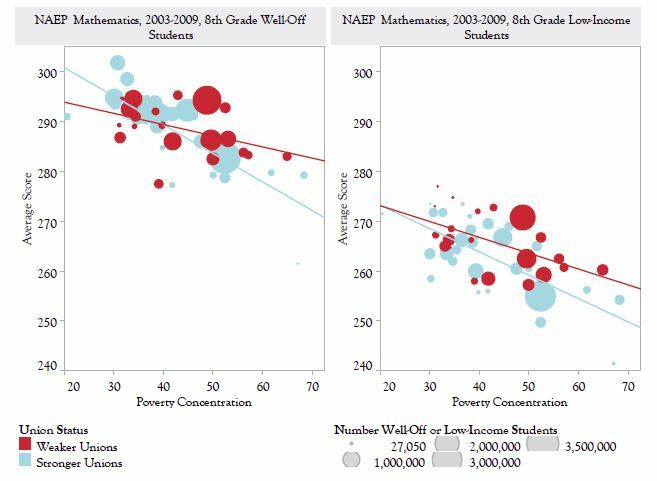 For low-income students the states with highest outcomes have weak unions. Differences in state performance that might be attributed to unions are small compared with effects of poverty. As an additional note, here is an interesting study by the conservative Fordham Institute that ranks the states by the strength of their teachers’ unions. By ANHPE in Education Reform, Improving Education, International Comparison on May 26, 2013 .